The neighborhood of Velluters is one of Valencia’s more colorful areas. And by colorful I mean, of course, crack-ridden and whore-infested. I’m not joking. Velluters is the last bastion of prostitution in the city, and the one downtown neighborhood where any tour guide worth his salt will urge visitors to steer clear of. 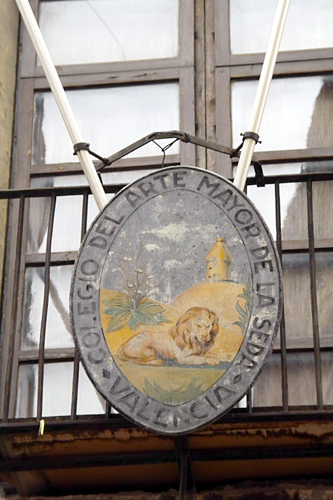 Construction began on the Colegio in the 15th century, and it was officially made the seat of the Valencian silk guild in 1492 (a year in which seems half of Spanish history occurred). Now a large, dour building, it was redone in Baroque style with a facade that features a relief of San Jerónimo, the college’s patron saint. 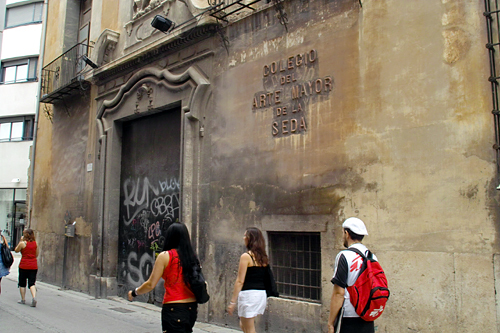 Although the Colegio de Seda was made an official museum of the city, it’s been under construction for some time, and currently can’t be visited. When we walked by, there didn’t seem to be any work being done, so we’re unsure of what the status on the construction is. A lot more information can be found here, in Spanish.